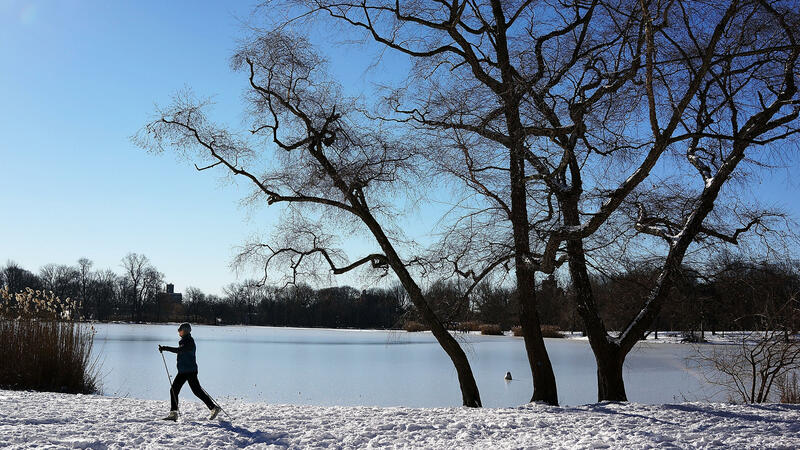 'Polar Vortex' Brings Bitter Cold, Heavy Snow To U.S.
A woman cross-country skis in Prospect Park in Brooklyn, N.Y., on Saturday. The National Weather Service is warning of "life-threatening wind chill" amid a record-breaking cold spell that has enveloped much of the nation. When the National Weather Service warns of "life-threatening wind chill" affecting the Northern and Central parts of the country, you'd better pay attention. "The coldest temperatures in almost two decades will spread into the northern and central U.S. today behind an arctic cold front. Combined with gusty winds, these temperatures will result in life-threatening wind chill values as low as 60 degrees below zero. Also, heavy snow will develop from the eastern Plains to the Great Lakes today, with up to a foot of accumulation possible." As Mark reported on Saturday, "record-breaking cold" is expected through Monday. It's being called a "polar vortex," and forecasters and other officials are repeating warnings of how dangerous the bitter cold can be. "We haven't seen the scope and severity of this cold air in at least 20 years," says Chris Vaccaro, a spokesman for the National Weather Service. "In some cases, it hasn't been this cold since 1995-1996." "The predictions are startling: 25 below zero in Fargo, N.D., minus 31 in International Falls, Minn., and 15 below in Indianapolis and Chicago. At those temperatures, exposed skin can get frostbitten in minutes and hypothermia can quickly set in as wind chills may reach 50, 60 or even 70 below zero." On top of the extreme temperatures, heavy snow is expected Sunday in parts of the Midwest. There was snow — some of it heavy — overnight in Chicago, Detroit, Indianapolis and St. Louis. The weather has forced the cancellations of thousands of flights.